When capitalism is based on privileges rather than merit, competition is distorted and creative destruction and firm churning slow down, with negative consequences for aggregate growth. In the case of Italy, many observers have attributed the unappealing performance of the Italian economy over the last 20 years to a cronyism disease (Pellegrino and Zingales 2017). While identifying a single factor to account for Italy’s economic performance would clearly be misleading (as stressed by Bugamelli and Lotti 2018, in their overview of the dismal evolution of productivity in Italy), our recent work sheds some light on the relevance of firm-level political connections in slowing down the process of creative destruction and hence productivity growth (Akcigit et al. 2018). Some firms can escape competition thanks in no small part to their political connections. In such a world, new productive firms may strive to outcompete politically connected incumbents, leading to reduced business dynamism and lower innovation in the market. In our study,we try to understand if political connections can affect firm dynamics, market competition, innovation, and the overall productivity dynamics in the economy. The rent-seeking behaviour by politicians and firms in Italy have been clearly documented (Cingano and Pinotti 2013). In our study – thanks to a newly available data set from the Italian Social Security office (through the VisitInps scholar programme) on the universe of firms and the employment histories of all private-sector workers from 1993–2014 – we are able to measure the scale of firm-level political connections for the universe of Italian firms, so as to better analyse their micro and macro implications. During our sample period, we have 32.8 million observations on firms (with 4.4 million unique firms) and more than 340 million observations on workers and their jobs. We match these data to the national registry of local politicians with information on all (more than half a million) politicians at the municipal, provincial, and regional levels, as well as to local elections data. In Italy, local politicians are allowed to work in the private sector while they hold political office – such as being a mayor, council member, etc. We identify a firm as being politically connected at a point in time if the firm employs at least one local politician at that time. To better understand firms’ performance, we match this data on firms and politicians with firm-level balance sheet information and patent data from the European Patent Office. The nature of this dataset allows us to exploit rich heterogeneity in the type of connections – based on the level or rank of a position, or the party affiliation of a politician employed. The focus on local politicians – at the municipal, provincial, and regional levels – is an important feature of our analysis. There are, on average, 131,000 local politicians per year – 0.3% of the overall working-age population. These politicians hold extensive power – among other duties, they have authority over and responsibility for the provision of local public goods and services, they have administrative authority over the issuing of various permits and licenses, and they are responsible for most of the administrative burden faced by private firms in Italy. Consistent with this, we identify industries that are subject to higher bureaucracy/regulatory burden using a newly constructed index based on newspaper articles about specific industries, and find that the higher the bureaucracy or regulatory burden an industry is subject to, the more pervasive (and important) connections are in that industry. We identify more than 112,000 unique firms who are connected at least once during their lifetime. Larger, as well as older firms tend to be more politically connected. Across industries, politically connected firms account for one third of employment. Market competition comes with a certain level of tension between the market leader and its competitors. While followers try to leapfrog the leader with new products or technological innovation, the leader may often rely on various defensive strategies to maintain its market position. These defensive strategies could include the establishment of political connections. In our empirical analysis, we identify some strong evidence to support this leadership paradox(see Figure 1) – within each market, defined at 6-digit industry-region-year level, market leaders are more likely than their direct competitors to be politically connected, but less likely to innovate (measured by the quantity and quality of patents and investments in intangible capital). 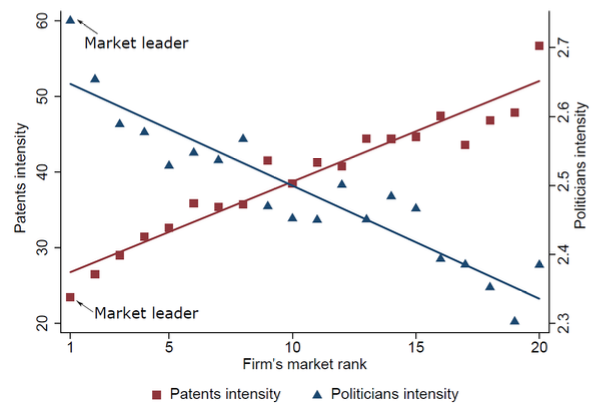 Notes: The figure plots politician intensity and innovation intensity over firm's market rank for the top 20 firms in the markets. Market is defined at the (6-digit) industry x region x year level. Markets in which top firm holds less than 10% share are excluded. Politician intensity (blue triangles) is the number of politicians employed in a firm normalised by 100 white-collar employees. Innovation intensity (red squares) is the number of patent applications in a year normalised by 100 white-collar employees (conditional on patenting). Both outcome variables are adjusted for industry, region, and year fixed effects. The blue and red lines depict regression lines from regressing politician intensity and innovation intensity, respectively, on market rank, controlling for industry, region, and year fixed effects. Nevertheless, our analysis shows that politically connected firms are more likely to survive in the market and to grow in terms of revenues and employment, and these benefits are increasing with the political power of the politicians that the connected firms employ. However, we find that this growth in size is not coupled with growth in productivity. These results are also vivid when we zoom in on the performance of connected firms around tightly contested elections. Using the data on all local elections in Italy and, based on vote allocation, we identify elections that have been decided on a thin margin (for example, 49%-51% vote split). Outcomes of these marginal elections can be treated as a coin flip (breaking news, weather shock, etc.). Hence, comparison of firms that have been connected right before a marginally contested election, with a politician from marginally losing versus marginally winning parties/coalitions of the next election, purges out concerns about anticipation and pre-determined differences between winning and losing firms. We find that post-election outcomes differ between marginally winning and marginally losing firms – those on the winning side grow much more in terms of size but not in productivity. These findings are consistent with the view that political connections help firms remove particular market frictions or block competition, as opposed to helping them push the productivity and technology frontiers. It seems that certain benefits that accrue to firms are also shared with those employees that that link the firm to the political game. To the extent that the official private-sector compensation reflects at least some part of these benefits, we observe that worker-politicians earn significant wage premiums relative to their co-workers, and that this isn’t explained by their individual characteristics. Not surprisingly, this premium increases with the political rank of a worker-politician. If we look at a more aggregate level, political connections tend to be associated with worse industry dynamics – lower entry, reallocation, growth, and productivity. This indicates that the effects of firm-level political connections go beyond the micro-level effects on connected firms and may imply significant social costs. In an environment with high market frictions (such as regulations or bureaucracy) – where a firm’s route to success often runs through the political system – political connections may hold back growth by lowering innovation and reallocation. What is clear from our study is that the effect of political connections go well beyond the private benefits to connected firms. While these connections might alleviate certain market frictions, such as regulatory barriers or bureaucratic burden, and provide some benefits to connected firms, on the other hand – by giving incumbents a powerful advantage over entrants – their detrimental impact on market competition and creative destruction might outweigh the firm-specific benefits. Our results could also shed some light on the declining business dynamism observed in the US and Europe, where market concentration has increased (Decker et al. 2016, De Loecker and Eechkout2018) and spending on lobbying has grown to record levels (Zingales 2012). Akcigit, U, S Baslandze and F Lotti (2018), “Connecting to power: Political connections, innovation, and firm dynamics,” NBER, working paper 25136. Bugamelli, M and F Lotti (2018), “Productivity growth in Italy: A tale of a slow-motion change,” Bank of Italy, Occasional Papers 422. Cingano, F and P Pinotti (2013), “Politicians at work: The private returns and social costs of political connections,” Journal of the European Economic Association 11(2): 433–465. De Loecker, J and J Eeckhout (2018), “Global market power,” NBER Working Paper 24768. Decker, R A, J Haltiwanger, R S Jarmin and J Miranda (2016), "Declining business dynamism: What we know and the way forward,” American Economic Review 106(5): 203–07. Pellegrino, B and L Zingales (2017), “Diagnosing the Italian disease,” NBER Working Paper 23694. Zingales, L (2010), A Capitalism for the People, Basic Books.